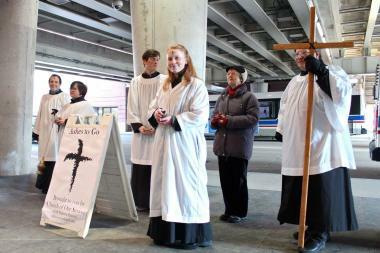 Members of Lincoln Park's Church of Our Saviour Episcopal Church dispense ashes to commuters outside the Fullerton "L" stop Wednesday morning. LINCOLN PARK — Coffee wasn't the only thing commuters were scooping up on the go Wednesday morning. Equipped with an 8-foot cross and a supply of ashes for hundreds of churchgoers, six members of Lincoln Park's Church of Our Saviour Episcopal Parish set up to administer "Ashes to Go" to mark the first day of Lent. "It's outside the box," said Steve Schwartzberg, the church's building office manager who was helping distribute the ashes. "It's outside the comfort zone, and it's good that way." Although the church's brick-and-mortar location is just a few blocks away from the "L" stop at 530 W. Fullerton Parkway, Schwartzberg said many people who had stopped for a quick blessing Wednesday morning had forgotten that it was the beginning of Lent. "I didn't even know it was Ash Wednesday," said Lincoln Park resident Helen Tekle, who stopped for a quick blessing before getting on the Brown Line for work. Tekle said she went to a church for ashes last year, and likely would have if it wasn't for the "Ashes to Go." This is the third year the church has set up shop on Fullerton under the "L", and church members will be there to give out the ashes again during the evening commute. Last year about 300 people stopped for a 15-second blessing, according to Schwartzberg. The ashes, which a minister places in the sign of a cross on Christians to mark the beginning of a 46-day period before Easter, are typically the ashes created by burning palms from the previous year's Palm Sunday.